Well the old saying “Shy bairns get nowt” is the reason I’m delighted to be able to include this post on Ravenous Fox. Every now and again I try to blag some content on Twitter from people far more talented and successful than myself with varying levels of success it has to be said. My flabber was well and truly gasted when Glynn Purnell replied to my request to do a guest chef spot! To many Glynn will be best known from his appearances on BBC’s Great British Menu. The “Yummie Brummie” as Olive Magazine dubbed him is undoubtedly one of Britain’s finest chefs and his skill and in the case of this particular recipe quirkiness gained him numerous accolades culminating in him being awarded Birmingham’s first Michelin Star January in 2005 as Head Chef at Jessica’s Restaurant and latterly in his first solo venture Purnell’s in 2009. So firstly to Glynn huge thanks for allowing me to include this iconic dessert recipe. I wish you and your team continued success and if your empire was to spread I urge you to travel in a Northerly direction up the A1 to Newcastle! the Custard Egg Surprise, served on a little egg stand with a teaspoon and a plate with strawberries and honeycomb. I walked past the table and was shocked to see that they had taken the eggs off the stands, put them on the plates and smashed them to bits with spoons. They were eating everything, shell included! All three of them. WTF! I went back to the kitchen and wasn’t really sure what to do. I waited for the plates to be returned to the kitchen and then asked the waiter, ‘What happened? What did they say? Add the bicarbonate of soda and quickly whisk to combine. The mixture will rise up in the pan when the bicarb is added, so be careful. Immediately pour the mixture into a non-stick baking tray. Add several grindings of black pepper and leave to cool and set for about 1 hour at room temperature, uncovered. Once set, break into shards. Combine all the ingredients except the strawberries in a saucepan and gently simmer until the liquid has reduced by half. Pour over the strawberries in a small bowl and leave to infuse for 30 minutes. 1.Heat the sugar and water in a heavy-based saucepan over a medium heat until the sugar has dissolved, then increase the heat slightly and bring to the boil. Every now and then, carefully swirl the pan to even out the heat and brush the sides of the pan with a pastry brush dipped in cold water to prevent sugar crystals forming. Boil for about 3–4 minutes, or until the mixture turns to a dark golden-brown caramel. 2.Pour the caramel into a greased non-stick baking tray and leave to cool and set for about 1 hour at room temperature, uncovered. Once set, shatter into small shards. 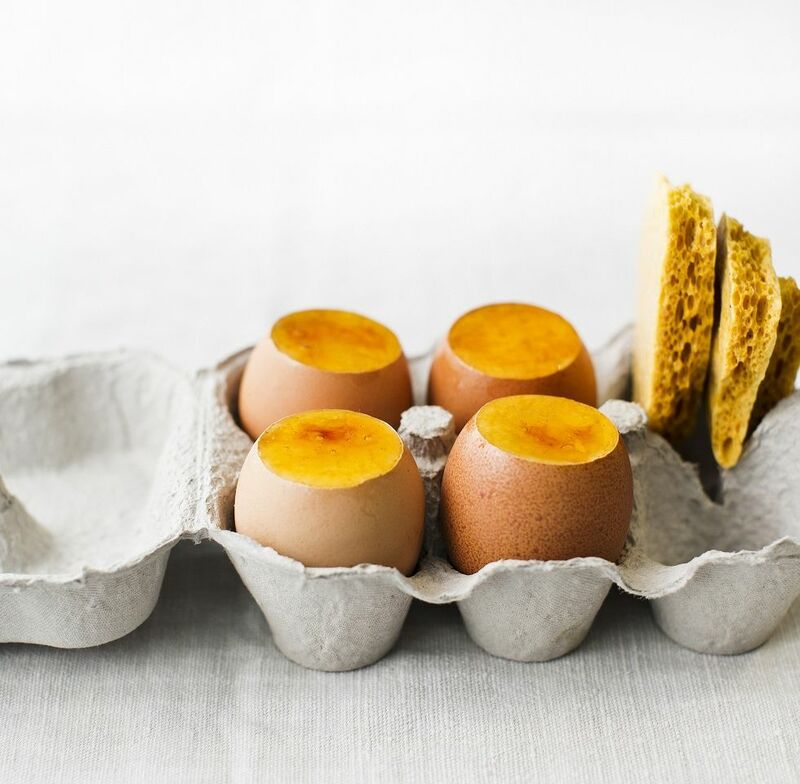 1.Remove the tops of the eggs (this is most easily done using a special egg- top remover, available from specialist kitchenware shops or online suppliers) and pour the contents through an egg separator (available from the same sources). Set aside the egg whites for use in another recipe such as meringue (they will keep, covered, in the fridge for 2 days) and put the egg yolks in a mixing bowl. Remove the membrane from the eggshells, then clean and dry the shells. 2.Add the sugar to the bowl with the egg yolks and whisk together until pale and fluffy. 3.Pour the cream into a small saucepan and add the seeds scraped from the vanilla pods along with the pods. Heat over a gentle heat until just below boiling point, then remove from the heat, discard the vanilla pods and pour the hot cream over the egg yolks and sugar and whisk until combined. 4.Pour the mixture into a clean saucepan, return to a gentle heat and stir until it starts to thicken enough to coat the back of a spoon. Set aside and leave to cool slightly. Carefully spoon or pipe the custard mixture into the cleaned eggshells and put them in an empty eggbox to keep them level. Sprinkle a little caramel over the custard in each egg and re-melt it using a kitchen blowtorch. Serve each egg in an eggcup on a small serving plate with the infused strawberries, decorated with the black pepper honeycomb and deep-fried tarragon leaves. I admit its a tough one!